A race in Macau had to be suspended after a 16-car pile-up obstructed a tight bend on the 3.8 mile circuit. The crash occured during the opening lap, the race was immediately red-flagged, as cranes were called in to clear the wreckage. 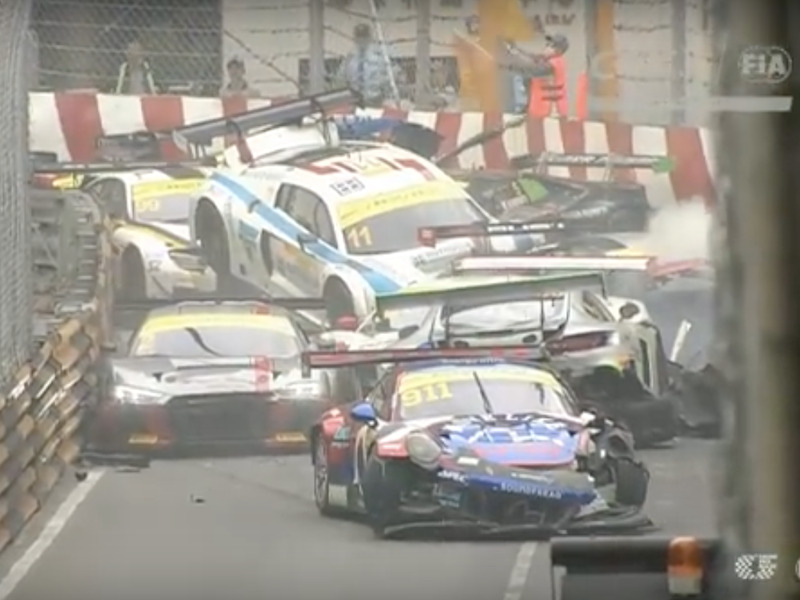 An FIA GT World Cup qualifying race had to be suspended after a massive pile-up obstructed a tight bend at a 3.8 mile track in Macau. Spanish racer Daniel Juncadella crashed into the wall by the “Police bend” in the very first lap. Though Raffaele Marciello was able to avoid Juncadella, 15 other cars in pursuit all crashed into each other. The race was immediately suspended and cranes were called in to clear the wreckage as only four cars out of 20 escaped the pile-up. There were no reports of injuries but only eight cars out of the 20 were made ready for the restart. You can watch footage of the incident here — the accident is around the 1m45sec mark.